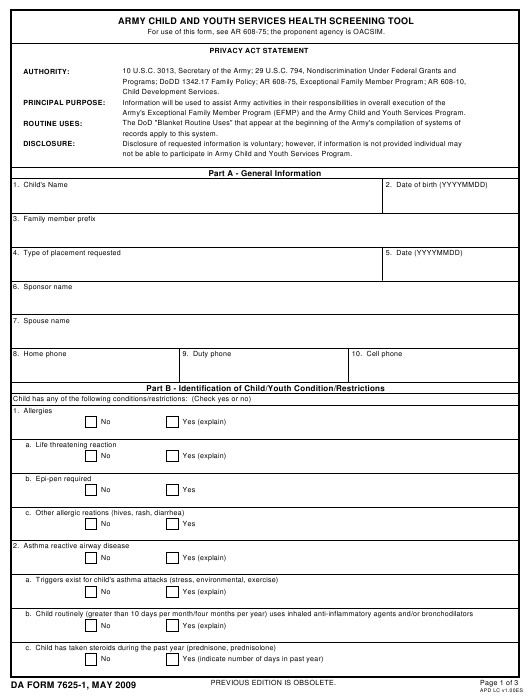 DA Form 7625-1 or the "Army Child And Youth Services Health Screening Tool" is a Department of the Army-issued form used by and within the United States Military. The form - often incorrectly referred to as the DD form 7625-1 - was last revised on May 1, 2009. Download an up-to-date fillable DA Form 7625-1 down below in PDF-format or look it up on the Army Publishing Directorate website. Army's Exceptional Family Member Program (EFMP) and the Army Child and Youth Services Program. records apply to this system. not be able to participate in Army Child and Youth Services Program. on this authorization prior to revocation is valid and will remain in effect. information will remain protected by the Privacy Act of 1974, 5 U.S.C. section 552a.